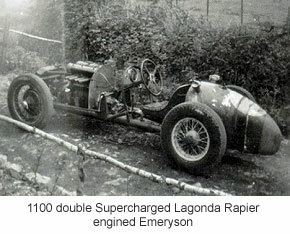 The 1100 Formula had by this time come about and in order to construct a car, George Emery had obtained a complete singer le-mans front suspension, a Lagonda Rapier engine, complete with the large first stage supercharger and an MG R type fuel tank, come body tail section along with the brakes. Peter managed to find the rear differential unit and internal gear train for a two speed transfer box and then fabricated a new case enabling it to be attached to the differential unit. The small second stage supercharger was a pressure cabin blower from a Merlin engine that was laying around as scrap at the ATA training school. Paul Emery agreed to supply the Wilson pre-selector gearbox. Working hard, only week-ends, George and Peter took the best part of a year to get what was the Emeryson 1100 up to a motoring chassis as in the attached photos. Working out the speeds at which the superchargers needed to run in relation to the engine, was new ground for George and Peter, though very interesting. Peter prepared the sketches and drawings during the week at the depot and returning to and from there to home in the weekends on a Radial valve Rudge. Even at the sketching stage Paul had become enthusiastic with the cars possibilities and had wanted to become involved but other than finding some parts, initially there was not a lot that he could do. Neither George, or Peter however were very experienced in panel beating and rather than being diverted from pursuing the task at hand, they left the body work to Paul. The car mechanically was pretty well completed by early in 1948 which was fortuitous as it was around the completion date that returning to the Camp one Sunday night, Peter met with an accident. A new officer of the day had decided that as the war was drawing to an end, security should be tightened and ordered the entrance gate to be closed. With dimmed lighting still being required at the time and with the roads covered in snow and ice, Peter drove straight into it at about 35 mph, the bar hitting him full in the face. This placed Peter in the Wheatly Royal Military Hospital at near Oxford for a few weeks, and would have been unable to work on the car. 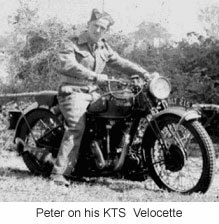 Hospital plus recuperation leave and allowing for the time allocation at the Military Educational Training College, Peters had saved enough to replace the Rudge with a Velocette KTS. 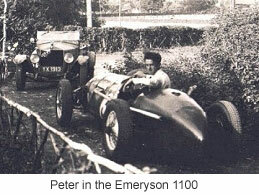 The Emeryson 1100’s debut was at Gransden lodge, without the cars bodywork being fully completed. At the time there were many press reports saying that the Emery’s had run out of money but it was not so much a matter of money as time and opportunity to get an early test experience. Paul having only just commenced active participation in the project and against Peters wishes now took the 1100 to Twickenham for completion, but had not had time to do much about the bodywork by the time the event had come around. Eric Winterbottom, a long term friend of George’s covered the costs of the meeting in order to give an idea of the cars potential. Peter had very real concerns that Paul would take over the running of the 1100 and whilst his Amyand Park road workshop had the required facilities which was providing Paul with a comfortable living and he had the connections and so was better placed than George or Peter at the time, there were few around that believed that the business could sponsor a racing enterprise. Like most after the war Paul no spare money and while those that knew Paul would have agreed that he was of a generous nature and there was never any hint that he would not do his best for the family, Peter thought it ” It was pretty damned obvious that Paul was expecting a free handover” of the 1100. 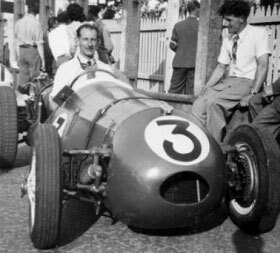 George, however having the major financial interest in the car persuaded Peter that by allowing Paul to take the car that they would be able to concentrate fully on plans and finances for the next project, a front wheel Drive 500cc car for the new 500 formula. Peter having fully recovered from the accident and soon to be released from service was now job hunting. George was uncertain how long the V.R.E would continue and having bought a plot of land at California, near Wokingham was hoping to build a house on it overlooking the lake. The planners clobbered it in the end although Georges daughter Muriel and husband Ernie did manage to get planning consent to build a very Attractive bungalow with swimming pool about half a mile further up the road. Eric Winterbottom again financed an entry but this time for Paul to drive the 1100 in the Manx Cup at the IOM. Peter still doing military service had managed to obtain leave for the event. George was along to keep an eye on the engine department but the most significant occurrence that Peter can remember was the beetroot gun fight that took place amongst the entrants supporters. This had involved welding blanking plates to three inch tubes and by letting in gas from their welding torch to a small hole at the back of the tube and dropping in a beetroot. By Aiming it at the garage opposite, then lighting the gas through the hole the beetroot would explode out of the tube like a mortar supporters had some fun. Paul had also earlier driven the 1100 at a speed trial at Great Auclum. 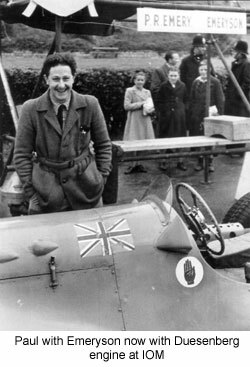 It was at Great Auclum that Paul would have met Robie Baird, as it was soon after that George and Peter heard that Baird wanted Paul to let him enter the car for the French Coupe de Lyon. (French GP). George and Peter thought that as constructors of the 1100 they were included but disappointed to find they were not included and it meant only Paul. Before going to France Paul drove it at Prescott and was second in the 1100cc class but the car was according to Peters not really suitable for the Hill. The 1100 formula was to be discontinued but Peter believes that had it continued they would have been happy to develop the car further. Finishes and lap times at Gransden, IOM and Leon proved that it was the fastest thing around in Britain at that time, irrespective of the engine capacity and that the 1100 had a lot more development potential. After the French G.P, Paul convened a meeting with George and Peter to discuss the best course of action for the following year. 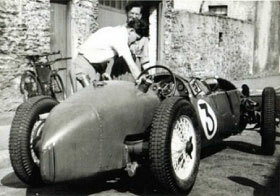 Paul wanted to change the engine, however Peter argued against it on the basis that there was nothing special about the chassis, the front suspension being too heavy and the brakes were inadequate for a larger engine and that the 1100’s success was solely down to the two staged supercharged engine. Paul countered claimed that they would not get spares for it and Peter contended that the Deusenberg Paul proposed for the car would be no easier to get spares for. Through out George remained quiet and said nothing. Unfortunately Paul resolved the impasse by shipping the car to Ireland, leaving both George and Peter devastated with a course of action they considered would see the highly competitive racing cars destruction. For Peter that was the end of an era for the first post war Emeryson but perhaps could be the birth of a new front wheel drive sensation. Subsequent to the car being taken to Ireland neither Peter nor George had anything more to do with the 1100cc. 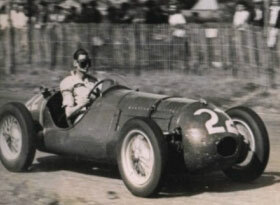 Baird had Paul convert it in the winter of 1947 into what they hoped to be a full-scale Grand Prix Formula car. 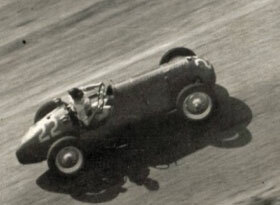 Having acquired the famous 4.5-litre, short stroke Duesenburg motor from the ex Whitney Straight Duesenberg Brooklands car but minus the supercharger, Paul cut through the tubular ladder frame chassis, inserting tubing just forward of the bulkhead and increasing the overall length by eight inches to accommodate the Duesenberg engine which was installed together with an ENV type 110 pre-selector gearbox. Welding in sections of thin gauge chassis tubing is not a good idea and Peter believes that Paul got cold feet and so added some “ghastly superstructure” in an attempt to reinforce it. The Singer Le Mans front and the rear suspension from the 1100cc car were retained whilst larger brakes were fitted and eight Amal carburettors added, raising the engine’s output to around 400 bhp. 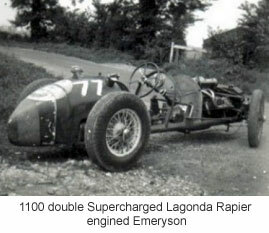 Baird raced the car occasionally but subsequently sold the Emeryson-Duesenberg and it was used it in hill-climbs and airfield races around Ireland for a number of years, during which time the chassis was apparently shortened, the Singer IFS removed and replaced by 2.5-litre Riley wishbones and torsion bars, all modifications which were carried out after Paul had returned to Surrey. The car in parts was latter shipped back to England, subsequently salvaged by Dennis Jenkinson for the engine which was reunited with the Duesenberg chassis, from which it had been taken and is now in the Brooklands museum. The remains of what started as the Emeryson 1100 went to Duncan Rabagliati and were later sold.